Hundreds of protesters marched in Berkeley, Calif. as part of a national movement that organizers call the "Fight for 15" on Wednesday, April 15, 2015. BERKELEY, Calif. (KGO) -- Hundreds of protesters marched in Berkeley on Wednesday as part of a national movement that organizers call the "Fight for 15." It's an effort to get the federal minimum wage increased to $15 an hour. Protesters marched from Sproul Plaza on the UC Berkeley campus to the McDonald's on the corner of Shattuck and University avenues. Typically, when minimum wage is discussed, you think restaurant workers, but this Fight for 15 also includes child care workers, cashiers and many more. They're also fighting to unionize, which would help low-income workers battle for health benefits, better wages and improved working conditions. "I believe if we as a nation come together for a living wage, everybody will benefit," protester Elaine Saulter said. Oakland recently increased its minimum wage to $13.25 an hour. Aunt Mary's Caf owner Jack Stewart started in the industry as a dishwasher. He says when minimum wages are mandated, it levels the playing field for small business owners because everyone increases prices to cover their additional labor costs. "It was certainly a challenge. We spent a lot of time plugging in numbers and going okay, what's going to work, what's the best way, what we can do," Stewart said. He thinks it will take more time to determine the full impact of the minimum wage increase on his business. The crowd marched peacefully and no arrests were made. No BART service disruptions were reported, but the large crowd has made some of the station entrances difficult to get to, one BART rider said. In the Bay Area, Wednesday's actions started early this morning in San Francisco with a 6 a.m. demonstration at a McDonald's franchise location at 24th and Mission streets. Similar strikes were planned in Oakland, San Jose and San Rafael. 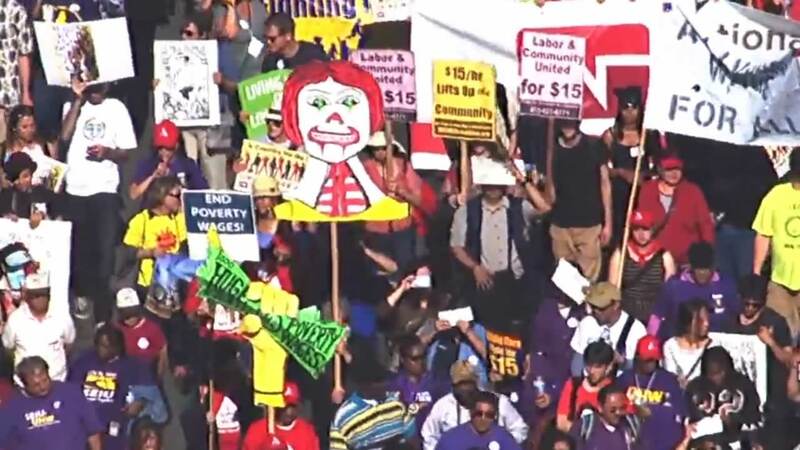 Workers throughout the Bay Area are protesting calling for a $15 per hour wage, arguing that low pay forces many workers to rely on taxpayer-funded public assistance programs for survival.